Iron-based nanoparticles supported on carbon (FeNPs@C) have enormous potential for environmental applications. Reported is a biomass-based method for FeNP@C synthesis that involves pyrolysis of bleached wood fiber pre-mixed with Fe3O4 nanoparticles. This method allows synthesis of iron-based nanoparticles with tunable chemical reactivity by changing the pyrolysis temperature. The FeNP@C synthesized at a pyrolysis temperature of 500 °C (FeNP@C-500) reacts violently (pyrophoric) when exposed to air, while FeNP@C prepared at 800 °C (FeNP@C-800) remains stable in ambient condition for at least 3 months. The FeNPs in FeNP@C-800 are mostly below 50 nm in diameter and are surrounded by carbon. The immediate carbon layer (within 5–15 nm radius) on the FeNPs is graphitized. Proof-of-concept environmental applications of FeNPs@C-800 were demonstrated by Rhodamine 6G and arsenate (V) removal from water. 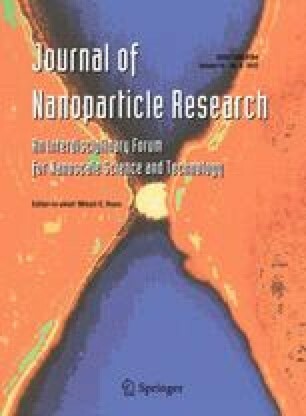 This biomass-based method provides an effective way for iron-based nanoparticle fabrication and biomass utilization. The online version of this article (doi: 10.1007/s11051-012-1023-1) contains supplementary material, which is available to authorized users. Research supported by the Center for Nanophase Materials Sciences (CNMS) and Shared Research Equipment (ShaRE) User Facilities at Oak Ridge National Laboratory, which are both sponsored by the Office of Basic Energy Sciences, U.S. Department of Energy. D. Z is thankful for support from NSF (EPS-0903787).